48 HOURS. NON STOP. NOT COMPLY. The rehearsal is an interactive synchronized swimming choreography generator. It is a motion monument with constantly changing shape and rhythm. It relays on human interaction with the machine, but even more between each other in creating the choreography. 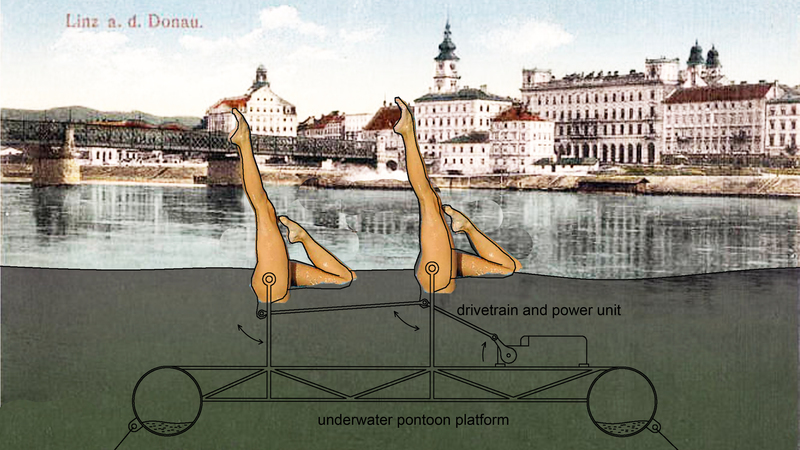 It consists of three pairs of pneumatically operated mechanical legs sticking out of Danube, orchestrated by three persons from the control desk on the shore. Each person is given nine preset synchronized swimming figures to choose from, and incorporate them into choreography by pressing the buttons. The participants become responsible for their own pair of legs, which act as their body extension and display their own sense of timing and rhythm. The choreographies are therefore always different and can vary from chaotic unsynchronized motion to harmonious and synchronous water ballet. The rehearsal is an attempt to bring strangers to play together, having fun by negotiating and rehearsing choreographies, rehearse communication, collectivism, share the responsibility but also the ownership of the piece. Karkatag is Belgrade based Serbian art collective. It exists since 2009. The collective’s works include machines, interactive and autonomous installations and manipulable objects. They use industrial materials and technologies in research of different natural and scientific phenomena, interactivity and performativity of machines, sound, motion. The collective introduces social aspects of its work through public actions and participatory performances in urban scenography. Karkatag has three permanent members that are together defining, managing and realizing the work of collective. Nevertheless, team structure is generally fluid and involves more people from project to project.